Thailand's early voting kicks off with crowds, long lines - Integration Through Media ....! 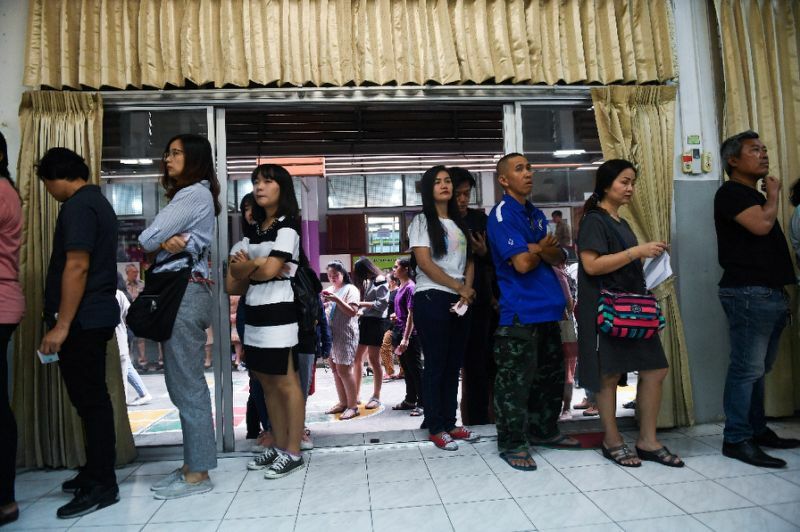 BANGKOK, (AFP) – Hundreds of thousands of voters crowded into schools, parking lots and temples across Thailand on Sunday, eager to cast an early ballot a week before the country’s first election in eight years. Advanced voting is usually a tepid affair, but on Sunday excitement was high as voters turned up in droves to polling stations.More than 2.3 million Thais are expected to vote before the official March 24 poll date. In Dusit district — home to military offices and government buildings — voters crowded in a school yard before a polling station there opened.People dressed in their work clothes — military uniforms, hospital scrubs and more casual attire — waited patiently to cast their ballot, aided by student helpers. At 9 am Prem Tinsulanonda, the powerful head of the Privy Council — the advisory board to Thai King Maha Vajialongkon — arrived at the school. Analysts say the new electoral system favours the army-aligned party fronted by junta leader Prayut Chan-O-Cha, who is running to be civilian prime minister after a government is formed.But voters on Sunday still held on to hopes for change.”I vote today in the hope for better change,” said Mart Bupa, 53.